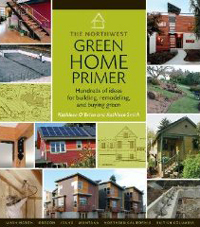 Kathleen O'Brien and Kathleen Smith published their first book, The Northwest Green Home Primer (2008) based on years of practical experience. O'Brien is a nationally recognized leader in sustainable building design and president of O'Brien &Co., a sustainable development and green building consulting firm. Smith is an architectural designer and sustainability consultant. Their collaboration led to a design-focused guide to creating an environmentally sound home. The book is filled with practical advice, examples from new and renovated green homes, and plenty of photos and diagrams. Best of all, the authors don't only write about green practices - they also practice them. O'Brien says that her favorite personal green strategy is "walking to work from my 'Built Green' home on Bainbridge Island to our downtown Seattle office". For more information on O'Brien&Co, please go to http://www.obrienandco.com.